classic strawberry shortcake recipe is a family favorite dessert. 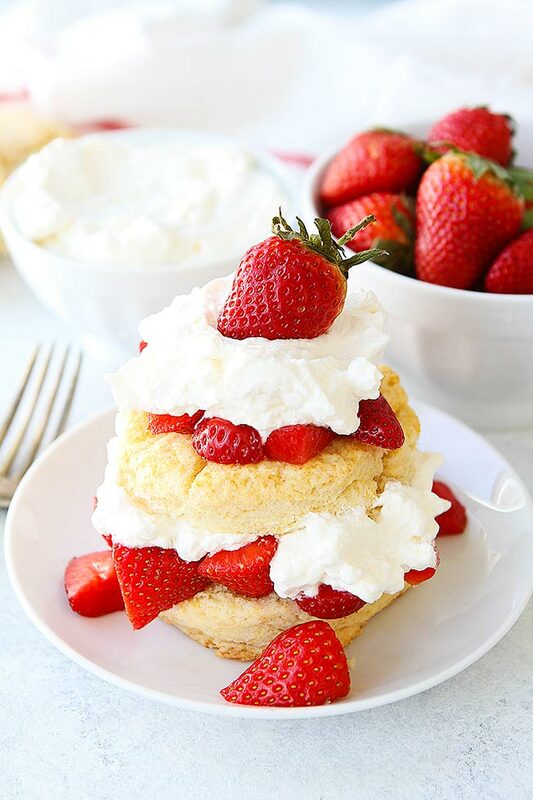 Tender Shortcake biscuits are topped with juicy strawberries and whipped cream for a delightful dessert! 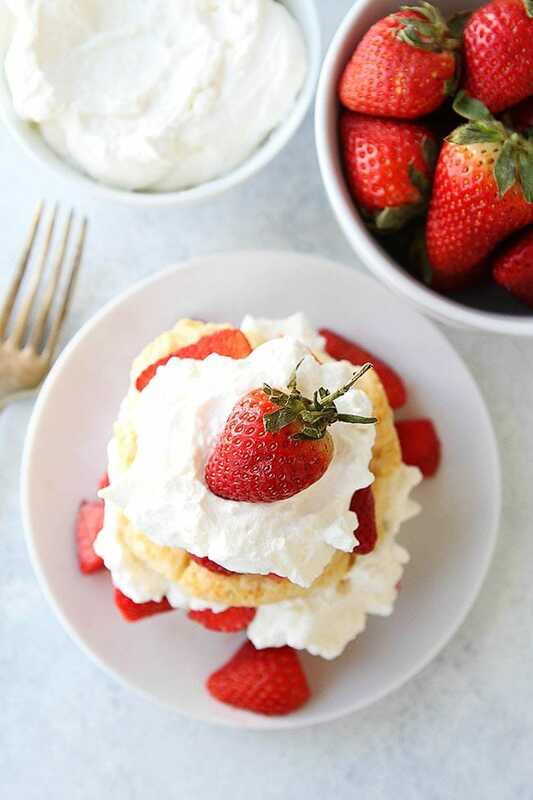 Strawberry Shortcake is a classic dessert because who doesn’t love tender, flaky biscuits topped with fresh strawberries and fluffy whipped cream. It is definitely a favorite dessert at our house, our boys LOVE strawberry shortcake. And I said biscuit because we are team biscuit when it comes to strawberry shortcake. 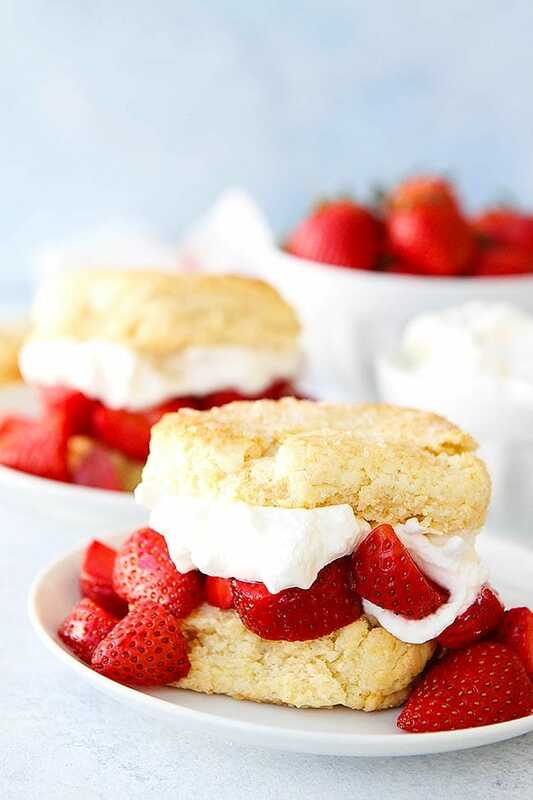 I know strawberry shortcake can be made with white cake, yellow cake, angel food cake, or sponge cake, but biscuits are the best…and not any biscuits, homemade shortcake biscuits. Strawberry shortcake from scratch is the way to go, and don’t stress, this strawberry shortcake is simple to make! See, the ingredients aren’t complicated. All standard baking ingredients, no need to be afraid. To help you have shortcake biscuit success, I am going to share a few biscuit baking tips. Make sure your baking powder is fresh. Baking powder is essential for getting the biscuits to rise. Sift together the dry ingredients so you don’t have any lumps. Start with cold butter and cold heavy cream. Be gentle when mixing the biscuit dough.? If you over mix the dough you will end up with tough and flat biscuits. Work quickly because you don’t want the biscuit dough to get too warm. Cut the biscuits with a biscuit cutter. Press straight down and don’t twist the cutter. If you twist, the dough layers will slant and the biscuits won’t cook evenly. Dip the cutter in flour between each cut to prevent sticking. Place the biscuits on a baking sheet and chill in the refrigerator for 20 minutes before baking. Chilling will make sure your biscuits are nice and cold after working them. Use a pastry brush to brush heavy cream on the biscuits before they go into the oven. I also like to sprinkle turbinado sugar on top for a pretty, crunchy, sugary crust. Bake at a high heat, 425 degrees F.
Let the biscuits cool completely before serving. 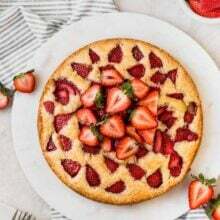 Strawberries are in season during the spring and early summer months and that is why strawberry shortcake is a popular spring and summer dessert. We like to make Strawberry Shortcake for Easter, Mother’s Day, and any day we have too many strawberries. To prepare the strawberries for strawberry shortcake, you can slice or quarter the strawberries, depending on their size. When the strawberries are big, I quarter them and when they are on the smaller side, I slice them. Put the strawberries in a large bowl and cover with granulated sugar. Stir until all of the strawberries are well coated with sugar. If your strawberries are super sweet you can use less sugar, but you do want to use sugar so the strawberries can get nice and juicy. Let the strawberries hangout in the fridge while you prepare the biscuits. You want to give them time to develop lots of juice. You can also serve the shortcakes with strawberries, blueberries, raspberries, and blackberries. The mix of berries is nice, especially during the summer months. We like to make red, white, and blue shortcakes for the 4th of July with strawberries, blueberries, and whipped cream. The shortcakes are so festive. Whipped cream is a MUST for strawberry shortcake. Make sure you use cold heavy cream to make whipped cream. We like to sweeten our whipped cream with confectioners’ sugar and a little vanilla extract. Whip the cream until stiff peaks form and the whipped cream is nice and fluffy. To assemble the shortcakes, use a sharp knife to cut the biscuits in half horizontally. Top the bottom biscuit with a generous spoonful of strawberries and a big dollop of whipped cream. Put the top biscuit on top. If you want to go all out, you can add more strawberries and whipped cream. Our boys always like a nice cloud of whipped cream on top! You can also break the biscuits in pieces and place them in a bowl with strawberries and whipped cream. Or you can keep the biscuits whole and top them with strawberries and whipped cream. There is no wrong way to eat strawberry shortcake. It is the perfect strawberry dessert, no matter how you eat it! 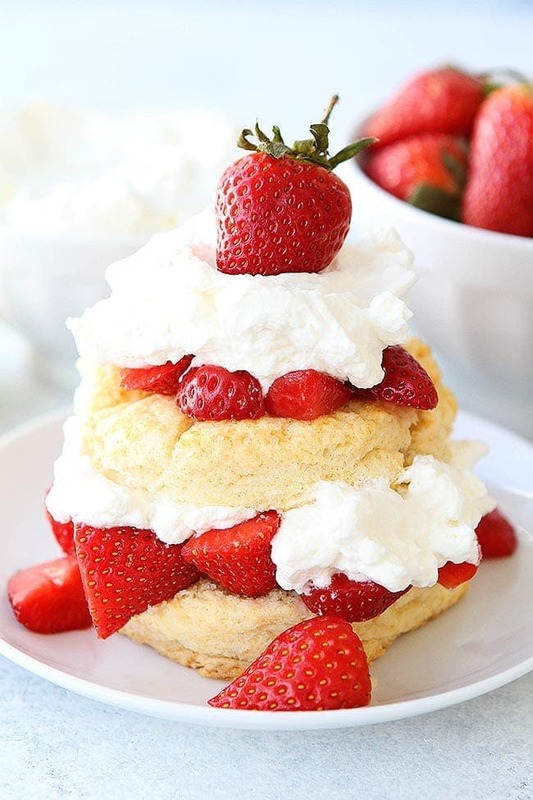 And if you want to eat strawberry shortcake for breakfast, I won’t tell:) Biscuits and fruit are involved so I think it makes a totally acceptable breakfast! 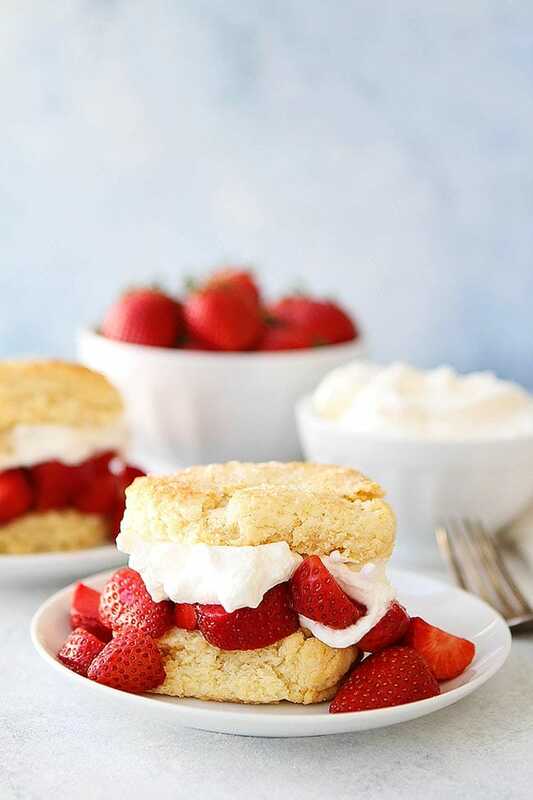 Take advantage of strawberry season and make the BEST strawberry shortcake! It is guaranteed to be a family favorite dessert! 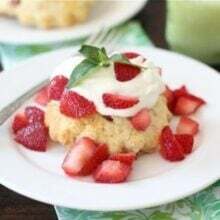 The BEST strawberry shortcake recipe with homemade biscuits, fresh strawberries, and sweetened whipped cream. The perfect dessert for spring and summer! Slice or quarter the strawberries and place them into a large bowl. Cover with granulated sugar and stir. Cover and refrigerate the strawberries while you make the shortcakes so they can get juicy. Preheat oven to 425 degrees F. Line a large baking sheet with a Silpat baking mat or parchment paper. Set aside. In a large bowl, sift together the flour, sugar, and baking powder. Mix in the salt. Add the small pieces of cold butter and use a pastry blender, fork, or your clean hands to cut the butter into the dry ingredients. Mix until you have pieces that are the size of peas. In a small bowl, stir together the cold heavy cream and vanilla extract. Pour the mixture over the flour mixture and stir until just combined. Turn out onto a lightly floured surface and lightly knead the dough together to incorporate all of the crumbly dough pieces. Do not overmix. Press the dough into a circle, about 1-inch thick and cut into rounds, using a biscuit cutter. Place the biscuits on the prepared baking sheet, about 2 inches apart. Place the pan in the refrigerator and chill the biscuits for 20 minutes before baking. Use a pastry brush to brush the chilled biscuit tops with heavy cream. Sprinkle tops generously with turbinado sugar. Bake the biscuits until golden brown, about 15-20 minutes. Let cool completely. While the biscuits are cooling, make the whipped cream. In the bowl of a stand mixer, whip the heavy cream, sugar, vanilla, and pinch of salt together until the cream reaches stiff peaks. To assemble the shortcakes, cut the biscuits in half horizontally. Spoon the strawberries over the bottom of the biscuit and add a dollop of whipped cream. Top with the other biscuit half. Add more strawberries and whipped cream on top, if desired. 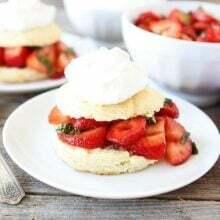 You can also break up the biscuits and top them with strawberries and whipped cream or leave them whole and add strawberries and whipped cream on top. Make Ahead-if you want to make the shortcake biscuits ahead of time, you can! Place unbaked biscuits on a lined baking sheet and freeze. When frozen, transfer the biscuits to a freezer bag and freeze for up to one month. When ready to bake, preheat oven to 425 degrees and bake for 23-26 minutes. You can also freeze baked shortcakes in a freezer bag for up to one month. Defrost before serving. You can warm them up in the oven, if desired. I’m so excited to see this! 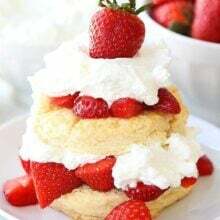 Like you I have loved strawberry shortcake since I was a little girl and when it’s fresh and in season it’s th only thing that can replace chocolate! Yet I’ve never attempted a traditional shortcake w biscuits (only cheated w pound cake & and strawberries!). Thanks I can’t wait to try this!!! This looks incredible! It is the ideal dessert for spring! Made this tonight for a family / birthday dinner. Very tasty and simple. I’m giving it five stars but I did have difficulty as butter seemed to leach from the shortcakes and burn in my oven and burn the bottom of my shortcakes. I make biscuits a lot and typically I use less butter. So maybe that was it??? Otherwise the taste and texture were just lovely. I am glad you liked the shortcakes! I have never had that problem. Was your butter cold enough? If the ingredients/shortcakes are warm they will spread a little, but I have never had any burn at all. Weird! Woah I love strawberry so much, thank you maria and josh for sharing this great article.. This recipe is on my waiting list.. I wish both of you a good day ! Have you ever made this with buttermilk? If so, how do the two compare in texture? the heavy cream makes them richer, but I bet buttermilk would work. 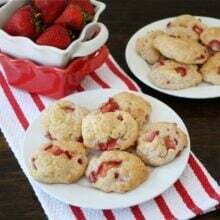 Made these biscuits last night for strawberry shortcake and they were amazing! So buttery and tender, everyone loved them. Definitely will be my go to for shortcake! Glad you loved the recipe! Can you make the biscuits the day before for a party or is it better fresh? Just made these for 4th of July bbq, and they were excellent! The best shortcakes I have ever had. Looks great! Can I freeze the biscuits and bake them the next day? Sorry I missed the make-ahead tip up top. Can’t wait to try it!